1. Add splashes of green and purple. 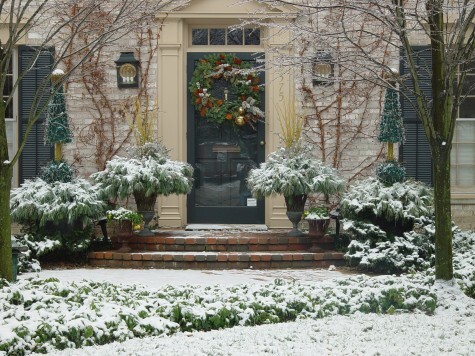 Plants, grasses, and evergreens can liven up a home’s winter landscape. Experiment with tall grasses, such as fountain grasses, that survive harsh winters. And in late fall and early winter, plants from the cabbage family add a vibrant purple color. Make the front door the focal point with a large wreath adorned with a colorful ribbon. To finish the look, place large, colorful planters filled with evergreens beside the front door. 2. Give it seasonal sparkle. Transform an unused bird bath or fountain into a seasonal display by adding twigs with red berries. Or fill frost-resistant urns with twigs, winter greenery, and sparkly baubles which is sold at most craft stores. For extra sparkle, roll twigs in glitter and incorporate a gazing ball – a mirrored glass ball available in various colors – into the display. 3. Make the garden statuesque. Roman or Greek-themed outdoor sculptures can add class and elegance to a garden in winter. Be sure to use frost-resistant statues so they don’t crack. Place the statues strategically throughout the garden to draw buyers’ eyes around the outdoor space. 4. Light it bright. During the winter, it’s more likely that buyers will be viewing home after sunset. 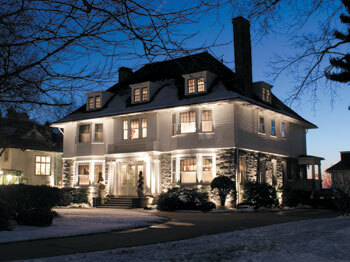 Use clear flood spotlights to focus on the home’s architectural features. Keep exterior lighting fixtures at maximum wattage and clean them regularly. When snow covers the ground, use exterior home pictures at night with all of the interior lights on – the light bounces off the white snow to create a warm, inviting glow. For the best results, turn off the flash, and use a tripod to avoid blurring. 5. Show off the lifestyle. Just because it’s cold outside doesn’t mean you can’t use the deck. Shovel and mulch your backyard sitting area, and leave your grill uncovered so buyers can envision themselves using the space. If the home has a hot tub, leave that open and running during showing as well. 6. Make the deck an extension of the house. Set up your outdoor tables and chairs just as you would in warmer months. Home owners often cover their furniture and place lawn objects haphazardly on the deck, where-as weatherproof cushions and pillows can play off of interior accent colors and make the indoor space feel larger and more interesting. 7. Create a photo display of sunnier days. Show buyers what the outside of the home looks like during other seasons by displaying some landscape photos in frames or using a digital photo frame with slide show images. This will give a sense of what the property looks like other times of year. If the home has a garden, make a list of what’s planted where. Perennials can be expensive and should be treated as a selling feature. 8. Don’t forget to clear a path. If the ground is covered in snow, the simplest and the most important thing you can do is shovel the driveway and sidewalks and keep the home’s patios and decks as clear as possible so buyers can get a sense of their true size.